SpongeBob: Mmmm! Isn't this saltwater taffy just taffy-licious? SpongeBob: What's the matter, Patrick? Patrick: I have a headache inside of my mouth! SpongeBob: Maybe you should do something about that. SpongeBob: How does that help? SpongeBob: That's it! I'm taking you to the dentist, Patrick. Patrick: No way! I've heard horror stories! SpongeBob: Oh, don't worry, Patrick. Dentists are our friends. (Patrick has disappeared) Huh? Patrick? Patrick? SpongeBob: Oh boy! Aren't dentist offices fun? (gaps) Oh, they've got colorful wooden beads on wires! (plays with the beads on wires) Oh, look at it go! Agnes: Patrick Star. We've ready for you now. Dr. Mundane: Agnes, please turn down that radio. (the ominous music stops) I'm Dr. Beige Mundane. You must be Patrick Star. What seems to be the problem? Patrick: No problem. I was just leaving. Dr. Mundane: Let's take a look in your mouth. Open wide please. (Patrick opens his mouth) Mmm-hmm. I see the problem. Your friend here still has a baby tooth. Patrick: I still have a baby tooth. Dr. Mundane: Yes. And the pain is coming from your adult tooth trying to push your baby tooth out of the way. Patrick: (gasps) That's not right! Patrick: Nobody's gonna tell me what to do with my baby tooth! This tooth is staying in my mouth! SpongeBob: Okay, Patrick. But that means your tooth won't be going to Tooth Island. SpongeBob: Yeah! Tooth Island! It's where the Tooth Ferry takes all the baby teeth that are left under pillows. (a visualization of Tooth Island is shown) Tooth Island is a wonderful place where teeth can be free! They can soak in the calcium pools all day or sleep in the comfort of the pink gum trees. They get to swing of floss vines and never ever have to worry about cavities. Baby teeth: (to Patrick's baby tooth) Hey, come on over! Come on! Patrick: I don't care, SpongeBob. I know what's best for my tooth! I can make it happy. Patrick: ♪Rock-a-bye baby on the treetop♪. SpongeBob: (hears Patrick screaming) My friendship sense is tingling. Patrick must be in trouble. (goes to the dining room) What's the matter, pal? Patrick: Nothing. Just uh... practicing being a seal! (starts clapping and barking like a seal. Craig Mammalton gets offended by this and leaves) Ow! SpongeBob: Patrick, Dr. Mundane always says, "If you can't bite, things ain't right." Patrick: Okay, SpongeBob. I guess I have to get my tooth to the Tooth Fairy. Squidward: (laughs) You rube. There's no such thing as a Tooth Fairy. SpongeBob: (he and Patrick gasp) Squidward! Squidward: It's all a bunch of made up baloney. SpongeBob: It is not baloney! Squidward: There is no baloney! Just like there is no Tooth Fairy. In fact, if you could prove there were a Tooth Fairy, I would eat, uh, a bucket of chum! SpongeBob: Squidward, why would you want to do that? Squidward: I said I would, only if there was a Tooth Fairy, and since there isn't a Tooth Fairy, I will never have to eat a bucket of chum. SpongeBob: Patrick, I've been your friend for a long time. I would never lie to you. You need Dr. Mundane's help so you could get your tooth to the Tooth Ferry. SpongeBob: You see, Patrick? We have got to get that tooth out. Patrick: You may have called off your worms, but I'm not coming down! SpongeBob: Patrick, they weren't mine. SpongeBob: It's a scrapbook of all my baby teeth. (shows the pictures) Ha. That was a good one. I remember every tooth. Even though they're no longer in my mouth, I still keep the memory of them in my heart. Patrick: (laughs) I thought you kept them in the scrapbook! SpongeBob: Patrick, don't you think your baby tooth wants to see all his old friends on Tooth Island? Patrick: Okay, SpongeBob. We can go. Patrick: I'm ready, Doc. Do what you have to do. Dr. Mundane: (removes Patrick's baby tooth with his pliers) I'm done. Patrick: You're going under my pillow so you can go to Tooth Island, my sweet boy! Squidward: Ha! I was right! The Tooth Fairy isn't real! Patrick: (feeling betrayed) Oh, SpongeBob! SpongeBob: Patrick, you don't understand! I'm just helping to get your tooth to the Tooth Ferry! Squidward: (sarcastically) Oh, that's a good one. Squidward: (laughs) Look at how betrayed Patrick feels! Oh, this was totally worth staying up all night. 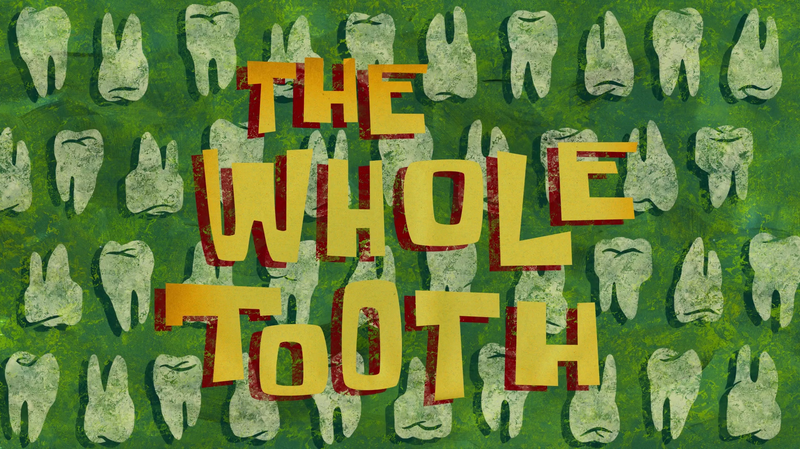 SpongeBob: This is where parents and friends take teeth so they can be ferried to Tooth Island! Patrick: There really is a Tooth Ferry! SpongeBob: (a dollar flies to him and he catches it) Oh, here. This is yours. Patrick: Could you wait 'til I'm asleep and put it under my pillow? Patrick: Hey! Where do you think you're going, chum chewer? Squidward: (Patrick picks him up) Hey, come on! This is just a big misunderstanding! "Ferry". "Fairy". They're two different words that just happen to sound alike! SpongeBob: (holds up a bucket of chum) Open wide, Squidward!